A behind-the-scenes look at the Des Moines Home + Garden Show. If you’re ready for a dose of spring—and who isn’t?—head to the annual Des Moines Home + Garden Show, February 11–14, at the Iowa Events Center. With more than 5,000 square feet of feature gardens, 435 exhibitors, and appearances by television celebrities, this annual event offers a treasure trove of inspiration and information for your home and outdoor projects. More than 39,000 people attended the Des Moines show last year. Tickets are $12 each at the box office for ages 13 and up; $10 at desmoineshomeandgardenshow.com. For ages 7 to 12, it’s $4; ages 6 and younger are free. Shannon Nathe has been managing the show for four years. She’s responsible for the overall vision of the event, along with coming up with new features, selling exhibit space, and much more. Nathe moved from Minnesota to Iowa 5½ years ago to produce the show locally for Marketplace Events, the largest producer of home shows in North America. What’s new at this year’s show? We have a new feature called “Better Gnomes and Gardens,” and it’s going to be really fun. We’ve distributed twelve ceramic gnomes to local television and radio celebrities, which they can DIY however they would like. Their creations will be put on display at the show, and attendees will vote for their favorite. The winner will be given $300 to donate to the charity of his or her choice. It’s fun to get the local media involved in things with the show. Every year, we partner with the Greater Des Moines Habitat for Humanity and its ReStore on a project. This year, they are designing their first silo chic designer shed, which is their take on one of the hottest backyard trends right now, the entertainment shed. Habitat’s version is actually made from a silo, and the interior will feature items from the ReStore. Entertainment sheds are just one of the latest extensions of the outdoor living trend. People will be able to come see the silo shed and take away ideas on how to transform their sheds into fun entertainment spaces. How do you come up with new ideas for the show each year? It’s about balancing fresh, new exhibits with tried-and-true staples. For example, the feature gardens are a visitor favorite. The No. 1 reason why people come to the show is to see the gardens. They want to see spring; they’re tired of winter. Every year, we work to make them bigger and better. We also have a very popular wine village with all Iowa wineries. For larger features, we really have to keep our eyes open and pay attention to what’s on people’s radar. For instance, last year we had the “tiny house,” recognizing the huge interest in smaller living spaces, which continues to be highly popular today. We also conduct surveys with exhibitors and attendees at the end of each show, and I take those opinions into account as I begin planning for next year. 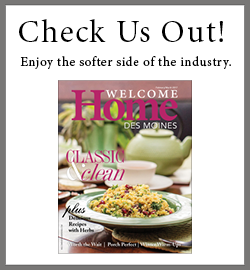 Marketplace Events is launching a new event this year, the Des Moines Home + Outdoor Living Show. Tell us more about it. One of the biggest differences between our two shows is that the one in March will have an even split between home and outdoor living. February’s home and garden show will focus 60 percent on home and 40 percent on outdoor. The reason behind the second show is two-fold. First, we found in our research that 96 percent of visitors are unique to each of our shows; so when you have two shows in a market, only 4 percent will go to both. So we were missing a whole segment of people. We’ve presented home and outdoor living shows in other markets and they’ve been extremely successful. Second, with the show taking place in March, we’re able to host many more outdoor companies such as greenhouses, garden centers, and landscapers because it’s closer to their working season. Some highlights of the outdoor living show are a large tree house and the ultimate backyard with a swim pond. Another feature I’m really excited about is, “Have Your Lawn and Eat it, Too.” Attendees will learn about edible flowers and weeds, and how to incorporate foods such as vegetables amongst traditional landscaping. Tickets are $10 each at the box office for ages 13 and up; $7 at desmoineshomeandoutdoorlivingshow.com. For ages 7 to 12, it’s $4; ages 6 and younger are free. How has moving production of the show to Iowa impacted its success? When you’re more entrenched in the market, you can better build relationships with exhibitors. I think there’s more trust when you’re a local office producing the show versus some company on the East or West coasts. It’s allowed me to foster deeper relationships with clients, nonprofit organizations, and other partners. What major changes have you seen in the home show business? I’ve been in the business for eight years. I think the biggest change is the use of social media. We use Twitter, Facebook, Instagram, as well as our newly revamped website, to promote our events. But the focus of shows remains unchanged: It’s about people meeting exhibitors face-to-face and making that personal connection. Attendees can see the quality of companies’ work, and have the chance to touch and feel products. I live in Ankeny with my husband, Pat Nathe, daughter, Alexa, and my brand new grandson, Jaxon. We also have a yellow Labrador retriever, Parker. In my spare time, I like to shop. I also love to cook and try new recipes off Pinterest. That’s my favorite thing to do on a Sunday.